The forthcoming election, it seems, will be fought mainly on issues of governance and economic performance. To the extent there is a focus on the personalities involved, such as Narendra Modi or Rahul Gandhi or Arvind Kejriwal or potential “Third Front” candidates, such as Nitish Kumar or Mamata Banerjee, most of the discussion is about their economic track record or lack thereof. This is a welcome development. However, in the grand theatre of Indian politics, facts often take a back seat to slogans, and opinions get sharply polarised. For example, we either hear that Gujarat’s economic performance has been nothing short of miraculous due to the magic touch of Modi or that Gujarat’s so-called growth story is all hype and a Public Relations campaign aimed at covering up a dark underbelly of poverty, inequality, and low levels of human development indicators. A lot of this debate reflects disagreements about two sets of issues. First, there are many dimensions of economic performance – level of per capita income1, growth rate of per capita income, Human Development Index (HDI) that put weight on not only income but also on non-income measures (for example, education and health), level of inequality, percentage of people below the poverty line, and many others. Which index we choose to emphasise reflects either our preferences as to the aspect of economic performance we value the most, or our views as to which dimension has to be improved (say, per capita income) for bettering the dimension we care about (say, poverty alleviation). Secondly, even if we focus on one particular dimension of economic performance, how do we attribute changes in this dimension to the role of a specific leader? For example, how do we isolate the contribution of Narendra Modi and Nitish Kumar to the growth of Gujarat and Bihar, respectively, in the 2000s, especially as the country as a whole experienced a growth spurt in this period? Therefore the first issue is how to separate the leader’s contribution from other factors driving his/ her state’s performance, for example, a general improvement in the economic environment of the country that benefits all states. The solution to this problem is to calculate the difference between the growth rate of the state for the years this leader was in power and the average growth rate of the rest of the states during the same period of time. If this difference is positive, then it is safe to say that under this leader the state grew faster than the rest of the country. However, this is not enough. What if the state in question was always growing faster than the rest of the country? How can we then isolate the specific role of this leader? Returning to the example of Modi, in order to claim that Modi’s leadership had a significant impact on Gujarat’s economic performance, it is not enough to show that Gujarat did better than the rest of India after he came to power in 2001. We have to demonstrate that the gap between Gujarat’s performance and that of the rest of India actually increased under his rule. This is the crux of the statistical method called differences in differences2, which is the standard approach used in modern economics to evaluate the performance of policies, organisations or individuals. Turning to evidence, we look at key indices of economic performance – level of per capita income, its growth rate, HDI, inequality, and the percentage of population below the poverty line – for sixteen major Indian states (in terms of population)3. In terms of average per capita income ranking of states over the 1980s, 1990s and 2000s, the top three states are Haryana, Punjab and Maharashtra (Table 1). Gujarat’s average rank is 4. On the other hand, Bihar, which has been in the news lately due to its spectacular turnaround over the recent years under the leadership of Nitish Kumar, has been consistently at the bottom of this league with a rank of 16, below Uttar Pradesh (UP), which too has remained steady at number 15. In terms of improving their relative ranking over the span of three decades, the top performers are Maharashtra, Gujarat, Kerala and Tamil Nadu. Interestingly, the rise in the ranks of these four states has been accompanied by the relative decline of one state, namely Punjab, which went from being the very top state in the 1980s and 1990s, to number 7 in 2010. This suggests that, as in athletic races, the relative rank of a state may go up or down due either to a change in its own performance or to a change in the performance of a rival. Thus, to obtain a fuller picture of the economic performance of these states, we also need to consider their relative growth performances. Is the rise in the rankings of states like Maharashtra and Gujarat also matched by a faster growth rate on their part? Also, are there states that are lower down in the ranking but are growing faster than average and so can hope to improve their ranking in the future? In Table 2, we present the annual average growth rates of the major states for each of the past three decades. 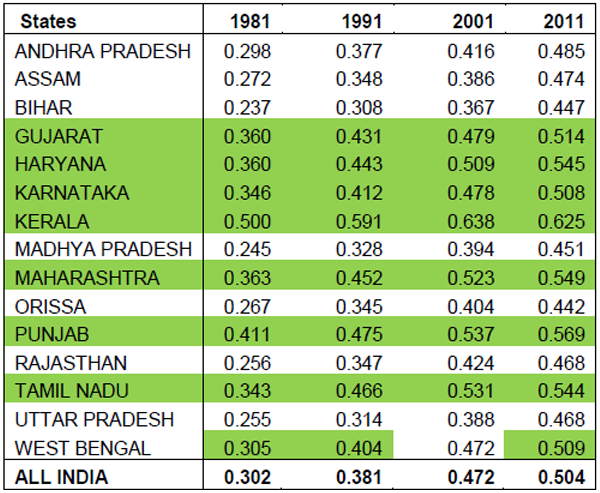 The highlighted boxes show states that are performing better than the national average in each decade. 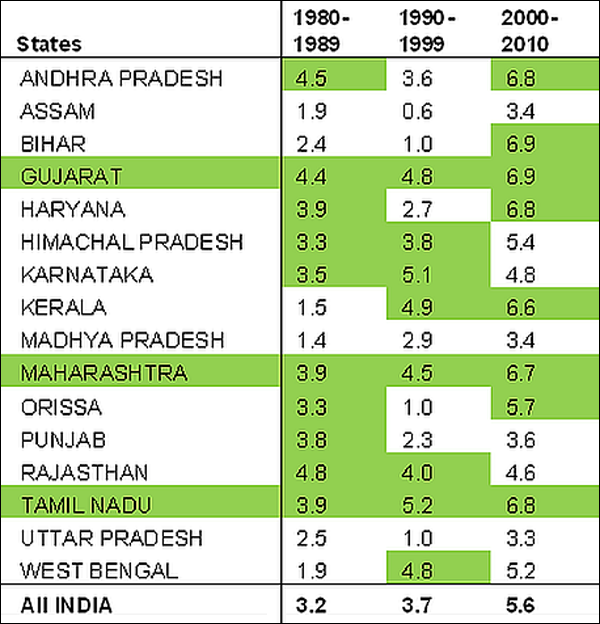 Only three states have had above average growth performance in all three decades – Gujarat, Tamil Nadu and Maharashtra. In the 2000s, the other top performers were Andhra Pradesh (AP), Bihar, Haryana and Kerala. Interestingly, the growth rate of Punjab, initially one of the top ranked states in terms of per capita income level, has been below the national average in the last two decades. Thus, it is not surprising that Punjab is slipping down in rank below other faster-growing states. Bihar, on the other hand, is poised to rise up the ranks with a higher than average growth rate of per capita income in the 2000s. Now we come to one of the key questions. Which are the states that improved their performance in the 2000s both with respect to their past performance in the earlier two decades, and with respect to the performance of other states in the 2000s? In Figure 1, we plot the average annual growth rates of some selected states against the national average over time. 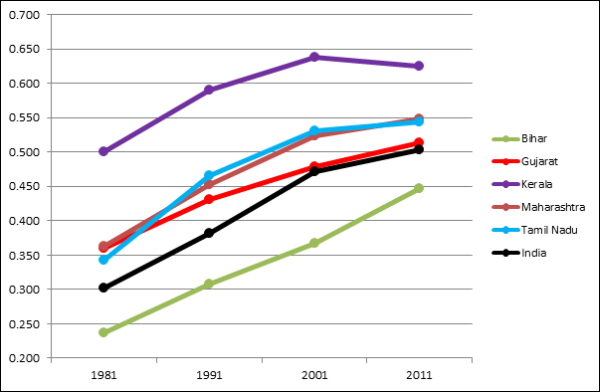 This graph shows an interesting trend – while Gujarat, Tamil Nadu and Maharashtra have been going neck to neck (along with Haryana, which is not shown in the figure), and as already mentioned, have consistently performed above the national average, none of them have experienced a huge acceleration in growth rate in the 2000s. In contrast, Bihar, which was consistently doing worse than the national average in both the 1980s and the 1990s, shot up above the national average in the 2000s, converging to rates achieved by established leaders like Gujarat, Maharashtra and Tamil Nadu. Note: For the sake of visual clarity, not all states are depicted in this and the subsequent figures. The rapid rise in Bihar’s growth rate is also evident from Figure 2, in which we compare the deviations of growth rates achieved by each of these selected states from the national average, for the 1990s and the 2000s. We can see that Bihar seems to have made the maximum gain in this dimension. 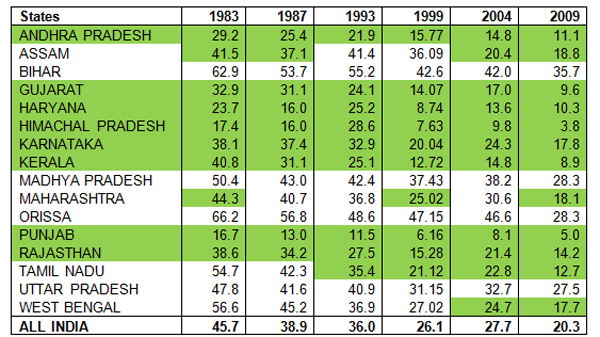 While in the 1990s, Bihar’s average growth rate was 2.7 percentage points lower than the national average, in the 2000s it was 1.3 percentage points higher. This means that Bihar improved its growth performance by an additional 4 percentage points over the national average in the 2000s, relative to what it achieved in the 1990s. 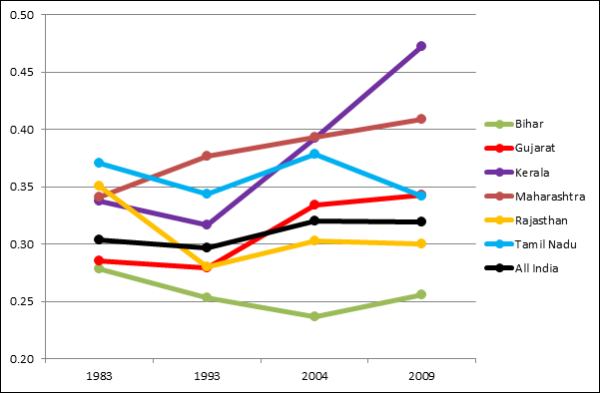 In contrast, leaders like Gujarat appear to have improved by a much smaller margin (0.2 percentage points) over the national average in the 2000s, relative to the 1990s. Maharashtra, too, gained only 0.3 percentage points over the national average during the same time. 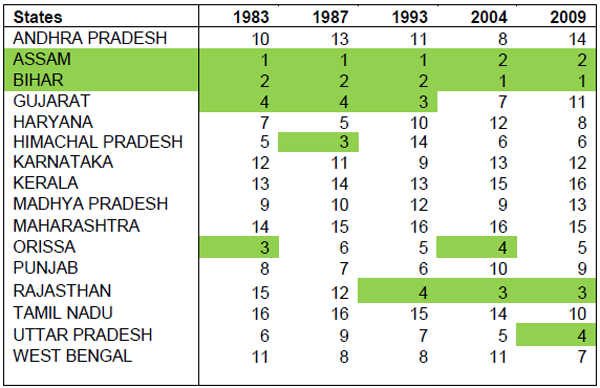 To sum up, if awards must be given, Bihar deserves the prize for the most dramatic turnaround in the 2000s. Gujarat gets credit for having steadily been on top of the league in terms of both the level of per capita income and growth rate, but has to share the honours with Maharashtra and Haryana in that category. Punjab dropped out of the top 5 in levels rankings in 2000s while Kerala broke into this select group. 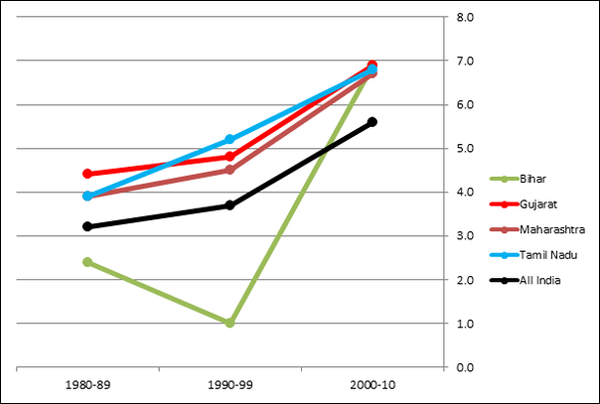 However, the key point is that there is no evidence of any significant growth acceleration in Gujarat in the 2000s. One could argue that it is easier to turn around a state that was at the bottom of the league like Bihar than to maintain, or to marginally improve, the performance of a state already at the top of the league, like Maharashtra, Haryana or Gujarat. After all, there is greater scope for improvement in the former case. Conversely, one could also argue that it is more challenging to turn around a backward state, because if it were easy, someone would have done it already. This is reinforced by the argument that Bihar is the third largest state, whereas Gujarat’s rank is 10th in terms of population and it is difficult to achieve sharp improvements in a larger than a smaller state. Many would argue that per capita income and its growth are only partial measures of economic development. Among other things, these indices ignore aspects of development that are not captured in income, such as life expectancy or education. Nor do these take into account income inequality, or the extent of poverty. Therefore, we now turn our attention to the performance of the states in terms of HDI, level of inequality and the percentage of people below the poverty line. 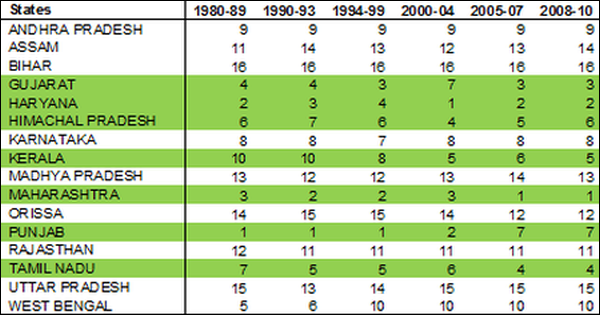 In Table 3, we present the HDI performance of all the major states for selected years over the last three decades. The highlighted boxes indicate states with HDI scores above the national average for each of these years. Kerala, Punjab, Maharashtra, Haryana, Tamil Nadu, Gujarat, and Karnataka are consistently in this group. In Figure 3, we plot the performance of some selected states with respect to the all-India average in terms of HDI. As expected, Kerala’s performance is literally off the charts. On the other hand, Maharashtra, Tamil Nadu and Gujarat appear to have been going head to head. Their trends tell an interesting story. While Gujarat’s HDI performance was above the national average in the 1980s and 1990s, it decelerated in the 2000s and came down to the national average. In contrast, Tamil Nadu and Maharashtra, which started off at a similar level of HDI as Gujarat in the 1980s, have continued to perform better than the national average in the 2000s. Bihar, on the other hand, has consistently been below the national average, but has made significant improvements over the last decade and shows signs of catching up to the national average. Thus, the HDI rankings of states present a different story than their rankings of per capita income levels or growth rates, with one exception. The only state that is in the top 3 in all the rankings so far is Maharashtra. Otherwise, the top prize for HDI goes to Kerala, and “the most improved in the 2000s” prize goes to Bihar. Next, we look at ranking of the states in terms of level of inequality (Table 4) based on consumption expenditure. Assam and Bihar have consistently had the lowest levels of inequality according to this index. However, the state that really stands out, both in terms of relative ranking and absolute decline in inequality is Rajasthan. Between early 1980s and late 2000s, Rajasthan’s relative ranking improved from 15th to third, while its inequality measure fell by 14%, the largest decline for any state. On the contrary, states that are leaders on the growth dimension are found to perform worse on inequality. 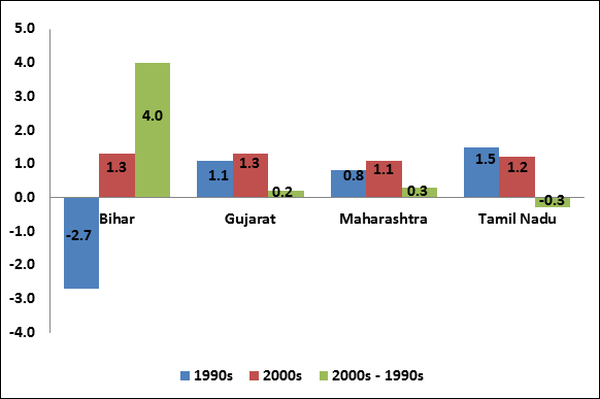 For example, Figure 4 shows that while inequality in Gujarat was lower than the national average in the 1980s and 1990s, it actually rose to levels above the national average in the 2000s. Maharashtra, Tamil Nadu and Kerala, too, have consistently recorded higher levels of inequality than rest of India, with Kerala recording a sharp spike in the 2000s. Lastly, we consider the percentage of population below the poverty line (Table 5). We find that Himachal Pradesh, Punjab, Kerala, Gujarat, Haryana, AP and Karnataka have consistently had lower levels of poverty than the all India average. Gujarat’s performance in poverty reduction over the years has been similar to that of AP and Kerala. However, if we look at improvements in performance over the last decade, then Tamil Nadu is one of the top performers. 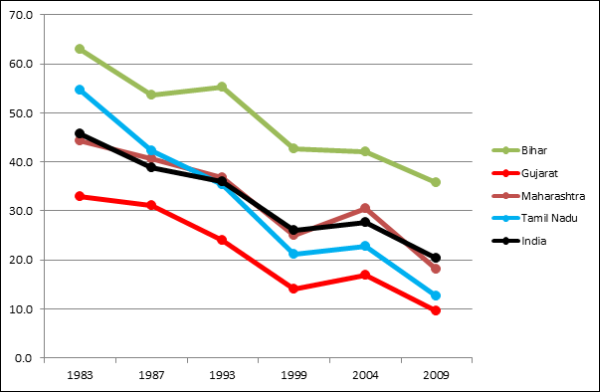 Starting from a level of poverty that was higher than the national average in 1983, it ended up at a much lower level, similar to that of Gujarat, AP and Kerala, in 2009 (Figure 5). Bihar, although well above the national average in terms of poverty levels all through the three decades, has shown a sharp improvement over the last decade. Did Gujarat truly outshine other states in the 2000s in terms of economic development? 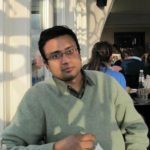 If we simply look at the figures, four facts will jump out: first, Bihar has improved the most in the 2000s, even though it has been at the bottom of the list for all indicators and still has a fair distance to go before it can climb above the national average; second, Kerala has far outpaced other states in terms of the HDI all through; third, Rajasthan was the star-performer in terms of reducing inequality; and fourth, Maharashtra and Gujarat have consistently been top performers in terms of per capita income and its growth, with Haryana and Tamil Nadu deserving mention on this count as well. All these achievements are noteworthy but it is hard to single out any state as the top performer in the 2000s. To the extent this assessment goes against the view held by many people, independent of their political leanings, that Gujarat has done spectacularly well under Mr. Modi, the explanation lies in the method that we have used to examine available data, namely, the difference in difference approach. In particular, this is what we tried to figure out: did a state that has for a long time been one of the most developed states in terms of per capita income, and was already improving at a rate higher than the rest of the country, accelerate further and significantly increase its lead under Mr. Narendra Modi’s stewardship? Our analysis shows that this did not happen. Both Maharashtra and Gujarat improved upon an already impressive growth trajectory in the 2000s, but the margin of improvement was too small to be statistically meaningful. So while Gujarat’s overall record is undoubtedly very good all through the last three decades, its performance in the 2000s does not seem to justify the wild euphoria and exuberant optimism about Modi’s economic leadership. Of course, it is possible that there are trends that this evidence cannot capture. Maybe with a longer time horizon, the effects of some of Mr. Modi’s policies will show up in the evidence, although given that Mr. Modi is now in his fourth consecutive term of power, this argument is not very strong. It is also possible that if Mr. Modi comes to power at the centre, he may well achieve a turnaround of the Indian economy due to his governance style. All that is possible in theory, but the existing evidence is insufficient to support these views. As Keynes had famously said in the context of stock market bubbles, often our decisions to do something, the full consequences of which will be drawn out over many days to come, can only be “taken as the result of animal spirits” – a spontaneous urge to action rather than inaction or rational calculation. In politics, too, maybe it is animal spirits that rule, not rational calculations based on statistical evidence. However, while election campaigns are run on slogans and sentiments, good governance depends on facts and figures. Bubbles eventually burst, and waves of euphoria recede. At some point the numbers need to add up. A slighted different version of this essay was published by the Outlook magazine in their March 22, 2014 issue. We would like to thank, without implicating in any way Sanjay Banerji, Pranab Bardhan, Francesco Caselli, Parikshit Ghosh, Reetika Khera, Ashok Kotwal, Milind Murugkar, and Sudha Narayanan for helpful feedback. We thank Ishan Bakshi for sharing data on inequality with us. 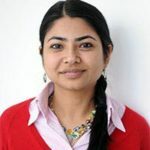 Editorial help from Manishita Dass is gratefully acknowledged. This Ideas for India column is available at http://ideasforindia.in/article.aspx?article_id=270. Per capita income of a state implies Net State Domestic Product (NSDP) per capita. In the simplest set-up, difference in differences compares the outcomes of two groups for two time periods. One of the groups is exposed to a treatment (for example, a policy change) in the second period but not the first. The second group is not exposed to the treatment in either period. To provide a clean measure of the impact of the treatment, the difference in differences technique subtracts the average gain of the second (control) group over the two periods from that of the first (treatment) group. This removes biases arising from permanent differences between the two groups as well as biases arising due to general (trend) changes in the treatment group over time. The larger a state, the harder it is to achieve improvements in per capita average economic indicators. Therefore, comparing a large state like Uttar Pradesh (UP) and a small state like Nagaland can be misleading and it is better to compare like with like. However, we have to keep in mind that even among the major states, turning around a state with a larger population is a harder task. Gini coefficient is the most commonly used measure of inequality. It captures the extent to which the distribution of income among individuals in a country deviates from a perfectly equal distribution. Thus, a Gini coefficient of 0 represents perfect equality while a coefficient of 1 represents perfect inequality. State level per capita income implies real net state domestic product (at constant prices) per capita. These data were downloaded from the Reserve Bank of India (RBI) website, available at http://www.rbi.org.in/scripts/AnnualPublications.aspxhead=Handbook%20of%20Statistics%20on%20Indian%20Economy. Growth rate of state per capita income was calculated on a year-on-year basis using the formula yt – yt-1/ yt-1 and these yearly figures were averaged to get the decadal figures. State level HDI data were downloaded from www.indiastat.com for years 1981, 1991 and 2001 and from the UNDP India report “Inequality-adjusted Human Development Index for India’s States 2011” by M.H. Suryanarayana, Ankush Agrawal and K. Seeta Prabhu for 2011, available at http://www.in.undp.org/content/dam/india/docs/inequality_adjusted_human_development_index_for_indias_state1.pdf. State level inequality data is obtained from calculations of Gini coefficients based on National Sample Survey (NSS) estimates of monthly per capita consumption expenditure at uniform recall period (URP). We thank Ishan Bakshi for sharing this data with us. State level data on percentage of people below poverty line for years 1983, 1987, 1993, 2004 and 2007 are obtained from Mukim and Panagariya (2013) “A Comprehensive Analysis of Poverty in India”, available at http://academiccommons.columbia.edu/catalog/ac:166686. These data were calculated using the 1973-1974 Lakhdawala poverty lines. Data for 1999 is obtained from P.K. Nayak, S. K. Chattopadhyay, A. V. Kumar and V. Dhanya (2010) “Inclusive Growth and Its Regional Dimesions” RBI Occasional Papers, Vol 31, No. 3. The data were originally collated from Planning Commission of India.